The last couple of months have seen some interesting newsflow in relation to electricity storage. Storage projects are increasingly popular, with developments occurring at every level of the system from grid-connected utility-scale projects to behind-the-meter domestic storage, and the Government together with Ofgem is keen to remove barriers to entry to allow storage assets to access the market more competitively. In its recent Future Energy Scenarios report, National Grid outlined that it expects storage growth to continue at a high rate to the early 2020s in each of its four future scenarios, driven by a fall in the cost of relevant technologies, ICT advances allowing better communication and control of assets, the growth in EVs, and the emergence of commercial opportunities. In common with most market participants, National Grid assumes that storage needs multiple sources of revenue in order to be viable, including balancing and ancillary services revenues, asset services for Distribution Network Operators and Transmission Owners, and wholesale arbitrage opportunities. Storage is expected to often be co-located with renewable generation, to minimise capital and network costs and reduce the need for buying from the grid for charging. Market saturation for storage is predicted to occur at different times in each scenario, beyond which cannibalisation occurs, meaning that projects are less likely to be economically viable. Ofgem intends to introduce a new licence condition into the generation licence requiring storage providers to ensure that they do not have self-consumption as the primary function when operating a storage facility. Electricity Storage in the electricity system is the conversion of electrical energy into a form of energy which can be stored, the storing of that energy, and the subsequent reconversion of that energy back into electrical energy. Electricity Storage Facility in the electricity system means a facility where Electricity Storage occurs. Ofgem proposes adding these two definitions to the electricity generation licence and to make relevant changes throughout the licence adding “electricity storage” or “electricity storage facility” where appropriate, and is consulting on whether the phrase “in a controllable manner” should be added to the definition of electricity storage. Another barrier storage facilities face is having to pay the cost of final consumption levies – specifically the Renewables Obligation, Feed-in Tariffs, Contracts for Difference and the Capacity Market. Storage providers are charges these levies when the storage facility consumes electricity in the charging phase, however, when the electricity is discharged for delivery to consumers, they are also charged levies on the same electricity – a double counting which reduces the competitiveness of storage. Ofgem wants to ensure that the cost of final consumption levies are allocated fairly and proposes introducing a new licence condition – Condition E1 – that requires the primary function of the storage facility to export electricity back to the distribution system or to the national electricity transmission system, ie not to have net internal electricity consumption as its primary function. This would prevent the storage facility from being an end consumer, thereby avoiding paying the final consumption levy costs. If the storage facility’s primary function is not to export to the distribution or transmission system, then such facility will not be classified as storage for regulatory purposes and would be subject to final consumption levies. Each DNO owns a fleet of small, mobile generator units of between 50 kW and 1.5 MW which are used in outage situations to keep customers on supply – storage units may be used for similar purposes. Ofgem considers that customers benefit from these applications through improved reliability and security of supply, and does not believe that these applications give rise to market distortions. The proposals therefore include a mechanism for DNOs to operate storage with explicit permission from Ofgem in very limited circumstances, with the onus being on DNOs to make the case for approval, demonstrating the exemption is in the best interests of customers and would not inhibit competition. The proposals will not prevent DNOs from owning storage assets, but they will not be able to operate them directly, except in the rare cases described above. In the majority of cases, operation of the storage facility would need to be carried out by an arm’s length subsidiary or affiliate. Some batteries may be less than fully charged at the start of a stress event if they are simultaneously participating in multiple commercial services. 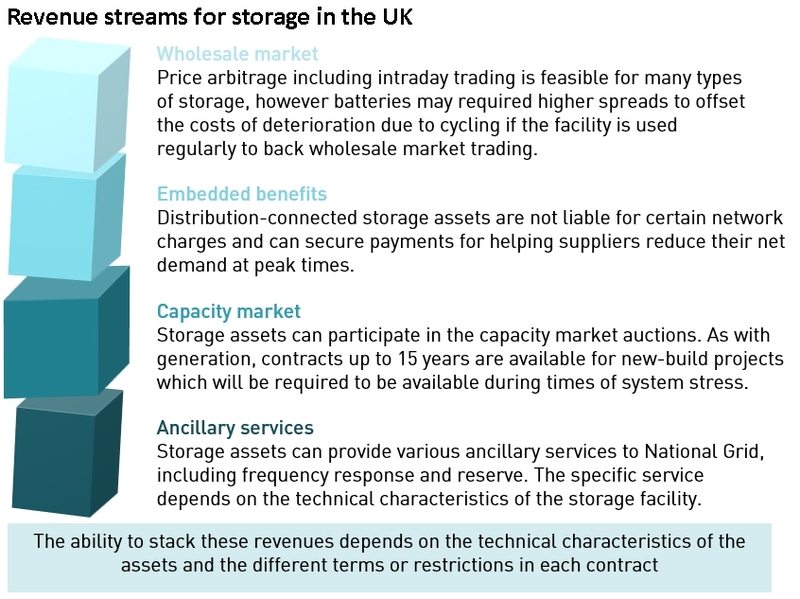 BEIS therefore proposes breaking down storage technologies into a number of categories based on duration, eg 30min-1hr; 1hr-1.5hr storage; etc. Each class will then be assigned a de-rating factor that is proportionate to how much support they can offer in a system stress event with longer duration storage being rewarded with a higher factor. Currently storage has a high de-rating factor of around 96% based largely on the good historical performance of pumped hydro. This means that if the proposed changes are adopted, short duration batteries will only achieve a proportion of the revenues they would have otherwise expected. If confirmed, the changes will be implemented from next auction, scheduled for February 2018. Ofgem expects to receive more applications from developers who have co-located storage alongside generation and wish continue to receive support under the Government’s environmental schemes. When wind and solar generation were first added to the grid, there was a lot of flexibility in the system in the form of thermal generation, particularly CCGTs. Over time, as the proportion of intermittent generation has grown, traditional sources of flexibility have been forced out by a combination of adverse economics and anti-pollution policies. E.ON has recently started construction on two 9.9 MW short-duration energy storage projects in the US, co-located with existing windfarms in Texas. 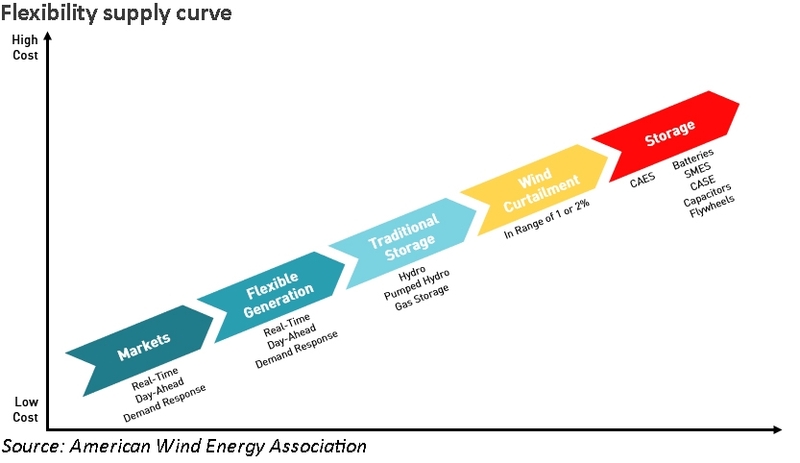 According to this piece by the American Wind Energy Association, storage is helpful but not necessary for the integration of wind, primarily as it is often not cost effective. “As the penetration of wind energy continues to grow, at some point in the distant future the amount of flexibility currently available on the grid may be fully tapped. However, there are innovative ways to utilise currently untapped sources of flexibility on the existing power grid that are less costly than new storage plants. Demand response, in which large power consumers like factories briefly reduce their non-essential power consumption in exchange for lower electric rates, is already being used by several grid operators to provide a large amount of flexibility at very low cost. Improved grid operational procedures can make the scheduling and dispatch (or use) of power plants more flexible. The expansion of energy markets, as well as the creation of markets for flexibility itself, can create strong incentives for power plant owners to make their plants more flexible. The piece also points out that many types of energy storage are poorly suited to offset the specific type of variability that wind energy introduces to the grid. Wind energy output has relatively low variability over the minute-to-minute timeframe, but can see significant changes in output over time periods of 30 minutes or more. Technologies such as battery storage, with typical durations in the region of 30 minutes, are not well aligned with the variability patterns of wind. Earlier this year, Greentech Media reported on the new co-location trend, and noted that the benefits are not always clear. It cited a perceived lack of benefit at Bosch’s hybrid energy system at Braderup in Germany, and GE’s Brilliant turbine which came with integrated proprietary Durathon sodium nickel-chloride batteries, which subsequently “faded from the market”. The speed with which new technologies are entering the system presents significant regulatory challenges. Various business models and revenue streams are available to project developers, but caution needs to be exercised since regulatory change can damage expected returns as well as create new opportunities. Sensible developers will anticipate regulatory change when designing their business plans and not assume that individual income streams will last for the length of the investment cycle. You can fix the problems of square wheels with especially designed active suspension, I am told, too. Storage and renewables may be becoming more ‘popular’ but they are not becoming more economically viable. You can also solve it with a curved surface as demonstrated by the very cool square-wheeled trike at the NY museum of mathematics – https://momath.org/gallery/ ….image 3! Storage is like renewables – uneconomic from a system perspective but can be very economic for project developers if they structure their business models to maximise the available revenue streams while keeping an eye on potential regulatory change.